Cassidy Fox '13 works with Beau Blass '20, a 2017 DukeEngage-Durham participant, at Threshold. When Cassidy Fox participated in DukeEngage-Durham in 2011, she volunteered at Threshold, an organization that helps local adults with severe mental illness stay out of the hospital, succeed at work, advance their education, and reach their goals. Seven years later, she’s now a full-time employee who often works with current DukeEngage students. Read on to learn why Cassidy chose to participate in a local DukeEngage program and how the experience shaped her professional path. During my first year at Duke, I found myself caught in the “Duke bubble.” I didn’t really know Durham outside of campus walls. I chose DukeEngage-Durham to get to know the community where I was living better. It also allowed me the opportunity to continue my engagement with the agency that I was placed with throughout my time in college and beyond. Immediately following my time at Duke, I worked in PTSD and TBI research with Duke and the Durham VA. While I enjoyed research, I ultimately wanted to work more directly with individuals. In 2016, I took a job as a part-time support specialist at Threshold (the agency where I was placed with DukeEngage) while I completed my master’s in social work at UNC. After graduating with my MSW, I started a full-time position at Threshold as the Employment Coordinator. Prior to coming to Threshold, I was unsure of how I could practically apply the psychology degree that I was getting from Duke. At Threshold, I finally saw real life examples of things that I had previously only read about in books. After that point, I had renewed interest in what I was studying because I could connect people that I cared about to the concepts that I was learning about. I was motivated to further my education by getting a MSW because I wanted to be better equipped to support the individuals who I work with at Threshold. Threshold continues to influence my career path to this day, as it is where I am currently employed. My DukeEngage experience showed me the way to take the privilege of my Duke education and use it to benefit the community around me. Finally being able to connect my academic studies with people who I cared about was really meaningful to me. Suddenly, the things I learned in class were not just abstract concepts. The information was more meaningful because it helped me learn how to better support members of a community that has been, and continues to be, so supportive of me. The biggest lesson that I learned from my DukeEngage experience is that community engagement is essential to break down the barriers between Duke and Durham. Prior to my summer in Durham, I had the preconceived notion shared by many of my peers that Durham was dangerous and there wasn’t much to do. My summer in Durham showed me how flawed this viewpoint was and caused me to encourage my classmates to explore Durham more when I went back to Duke. The only way that I was really able to challenge the stigma against Durham was to have experiences that helped me see an alternative, and more correct, way of thinking. Without the opportunity to explore Durham, Duke students may be prone to fall into problematic ways of thinking about the community around them as I initially was. DukeEngage allowed me to step out of my comfort zone and better know the community that I now consider my home. Are you still connected to DukeEngage? If so, how and why? As an employee of Threshold, I have had the opportunity to work with DukeEngage students from the other side. 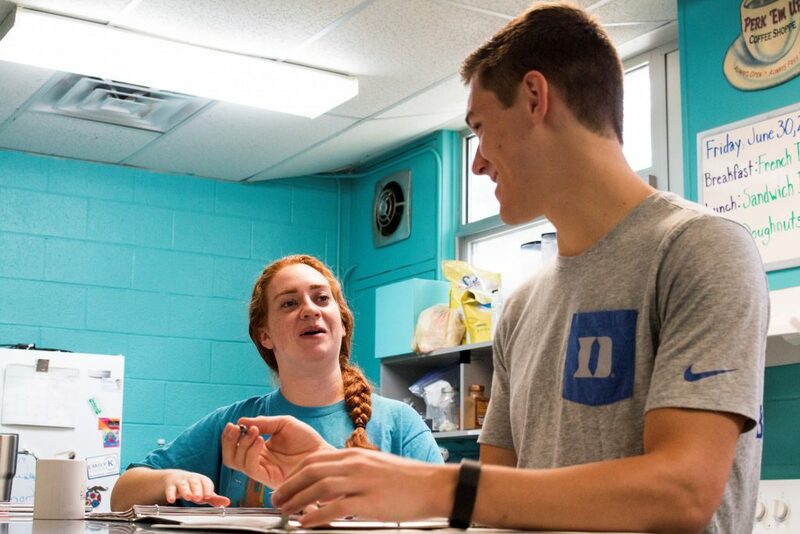 It has been rewarding to be able to continue to support the mission of DukeEngage-Durham and see new generations of Duke students getting to know the community where they are living. The DukeEngage program is incredibly important in its ability to expose Duke students to experiences or ways of thinking that they may not have been exposed to otherwise. The DukeEngage program has been instrumental in my development as both a professional and as a person. It was an essential part of my Duke experience and I am glad that Duke students continue to have this experience. I think it is essential to keep an open mind while participating in the DukeEngage program. In doing this, I was able to rediscover the community around me and develop a more well-rounded understanding of the place I lived.